To provide comprehensive medical care to patients of all ages through excellence, commitment, integrity, and compassion. To promote the health and well-being of patients and the community by providing access to high-quality, compassionate health care while empowering patients to improve their health through education and prevention. We firmly embrace the medical home concept, centralizing all your basic health care needs, while caring for the entire family. We strive to build long-term relationships with the community, patients, and their families built on trust and mutual respect. We strongly believe in prevention of disease and promotion of healthy life-styles and activities. We believe in the ethical practice of medicine, provide leadership throughout the community, and provide needed services among our community and surrounding communities. 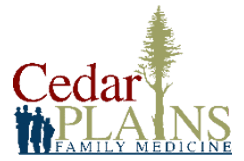 Cedar Plains Family Medicine strives to provide clinical excellence, comprehensive and compassionate health care, and open communication to improve the lives of our patient’s and family members. We are devoted to patient outcomes and health awareness to improve quality of life. We honor individuality and empower people through open and honest communication with every person we serve. Quality. We maintain the highest standards and achieve them by continually measuring, evaluating, and improving our outcomes. Innovation. We welcome change, encourage invention and continually seek better, more efficient ways to achieve our goals for the benefit of the patients, families, and the organization. Teamwork. We collaborate with specialists and other health care providers to improve the care provided to patients and their families. Compassion. We demonstrate our commitment to high quality health care by providing a caring and supportive environment for our patients, patients' families and staff. Empowerment. Through a partnership with our providers, we strive to empower patient’s and families to become active members in their health care.